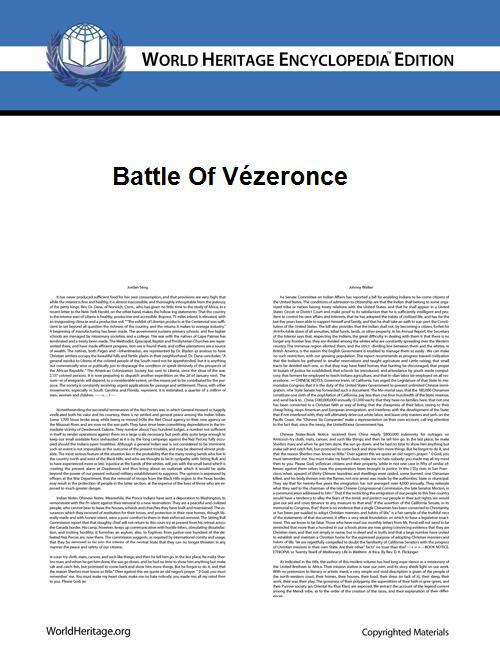 The Battle of Vézeronce took place on June 25, 524 near Vézeronce-Curtin (then Veseruntia) in Isère, France. This battle was part of an invasion of Burgundy initiated by the four successors of the Frankish king Clovis I: Childebert I, Chlodomir, Chlothar I, and Theuderic I. The Burgundian king Sigismund was defeated during the battle. However, Chlodomir, the leader of the Frankish army, was killed during the fighting by Sigismund's brother Gundomar III. To avenge Chlodomir's death, after the battle Sigismund and his two sons were slain by the Franks. Chlothar and Childebert then completed their conquest at Vézeronce by defeating Gundomar and his allied Ostrogoths. Aside from the definitive defeat of the Burgundians, which reversed their fortunes permanently and assured the annexation of their kingdom to the Merovingians', the chief legacy of the battle within Francia was the division of Chlodomir's kingdom among his brothers and the dispossession (and murder) of his young heirs.